The dominant trend in global equities markets over the last decade has been the growing influence of the technology sector. The decade-long bull, and counting, bull market on Wall Street that followed the international financial crisis of 2008/09 has been fuelled by the astounding growth rates of the tech giants. The ‘FAANGs’ of Facebook, Amazon, Apple, Netflix and Google (Alphabet) have not only reshaped the industries they have ‘disrupted’ or created but also equities markets. Despite the almost constant speculation that ‘value’ stocks will come back into cycle, and they may well at some point, growth companies where valuations are based on future potential far more than current revenues and profits, have been the success stories of many years now. 15 or 20 years ago it would have been impossible for loss-making companies, or those with very modest revenues, to be worth tens or even hundreds of billions. Companies categorised as ‘tech’ and considered to have strong growth prospects often have market valuations that tower over others in the same industry with far higher turnovers and profitability. Microsoft has also roared back and is currently again the biggest of the lot. And then there are other giants such as Nvidia, the chip maker and Tesla, the young pretender with a gallous CEO (Elon Musk) in the electric and driverless vehicles sector. Tesla is a perfect example of a ‘tech’ company benefiting from current market sentiment. Its valuation is much higher than that of Ford and General Motors as a multiple of earnings and profits. Its valuation was, until last autumn, much higher than both full stop. Tesla is still ahead of Ford but has dropped back below GM following the late 2018 tech sell-off from which it has had a more sluggish recovery than other tech giants. But the pool is rich and deep. Beyond the best known tech companies there are tens more valued in the multi-billion market cap. bracket. There are around 90 U.S. tech stocks valued at over £10 billion. There are 750-ish ‘tech’ sector companies listed on Wall Street covering the entire span of big caps, middle caps and micro caps. Some of the biggest tech companies in the world from outside of the U.S. are also listed on its exchanges. China’s Alibaba, Baidu and Weibo all have listings, as does Sweden’s Spotify, Australia’s Atlassian and German travel-tech portal Trivago. London-Listed Tech: Is There An Opportunity? There’s been plenty of recent positivity around the UK tech scene in recent times. Fintech companies have particularly come to the fore with a handful of freshly-minted ‘unicorns’ – companies valued at more than £1 billion. Monzo, TransferWise, Starling and Revolut are all valued at over a billion. But they are still private companies. You can’t just go and buy shares in them through your stockbroker. Funding Circle, the P2P lender has now listed and several more will surely follow over the next couple of years. But overall, the tech stock pickings are certainly slimmer for those investing online and keen to give some love to home grown technology companies. One of the factors behind the UK tech sector trailing that of the USA, other than the fact the latter is simply a much bigger country and market, is the level of investment capital finance available during a start-ups early development. Adjusted for population size, U.S. technology start-ups are able to take advantage of almost three times higher levels of venture capital funding. In 2017, £63.7 billion was spent by venture capital companies closing investment deals in U.S. tech companies. In the UK the figure was £5.8 billion. Less access to venture capital while still young and privately owned appears to have a direct correlation to the number of UK tech start-ups that make it to a stock exchange listing. But that doesn’t mean there aren’t good UK technology investment opportunities for all of you investing online into ISAs and SIPPs. If you are inclined to explore the UK’s best tech stock opportunities, the two main options open to you are either to select individual shares to construct your own portfolio, or to opt for a fund. A good resource for the former is a recent analysis of UK Tech Stocks published by stock screening application Stockopedia. Using the Stockopedia screening tools, analyst Ben Hobson offers 3 different selections of UK tech stocks based on size, those which show up best based on a blend of Quality, Value and Momentum indicators and another screening highlighting those with below-average P/Es, growing earnings, low debt and positive momentum. 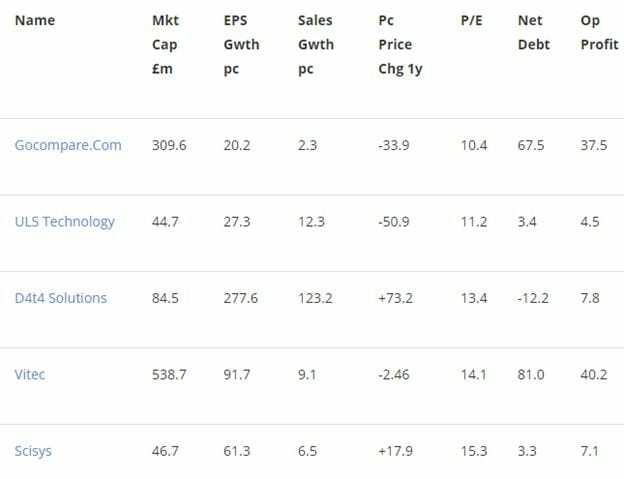 The UK’s five biggest tech stocks by market capitalisation are Micro Focus, the software development and IT consultancy group, Sage, a Cloud-based accountancy software provider, Just Eat, the take-away delivery app, AVEVA, an engineering and industrial software company and Rightmove, the online real estate portal. 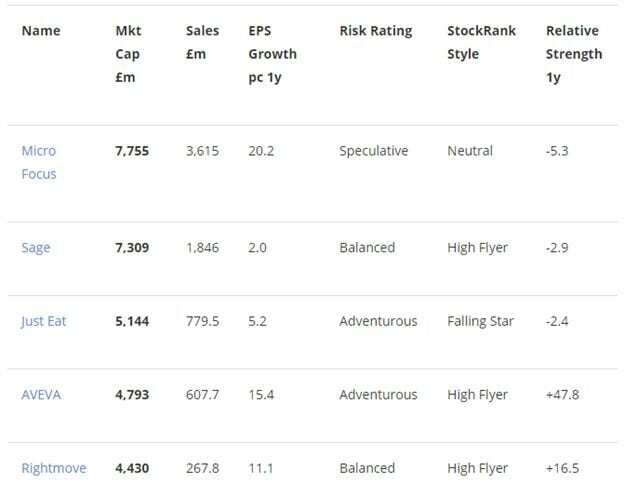 Of the five, only Rightmove and AVEVA delivered positive returns last year while the remaining three underperformed the FTSE All-Share benchmark. This demonstrates the difference between the biggest U.S. tech stocks driving S&P 500 returns and the situation in the UK where the sector and companies themselves are less influential. Just picking out the biggest to buy is unlikely to be as successful as the same strategy with the Faangs and Microsoft would have been Stateside. Scanning for UK tech stocks based on those which demonstrate the strongest current fundamentals across Quality, Value and Momentum indicators throws up a completely different 5. Those are cyber security specialists Synectics, software solutions company Sanderson, Universe, the IT service management company, telecoms tester Spirent and Vitec Group who make photography and imaging hardware and software. 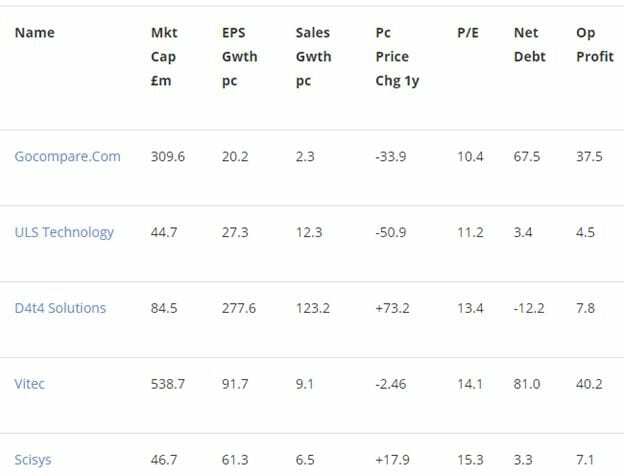 And a final five UK tech stocks are highlighted based on a “growth as a reasonable price” approach to screening that took into consideration below-average P/Es, growing earnings, low debt and positive momentum. 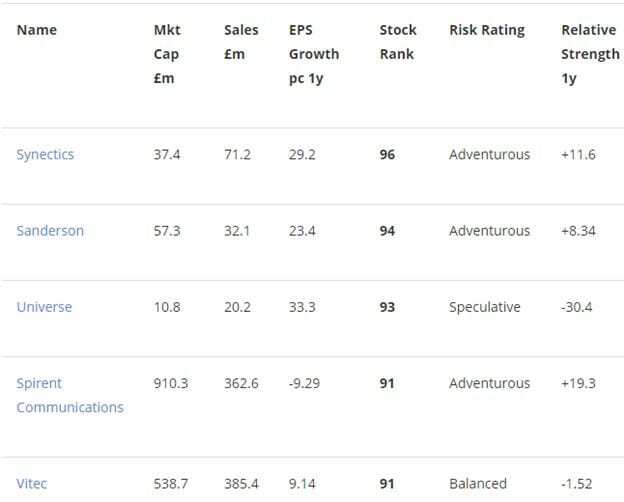 Those five include Vitec Group again, plus GoCompare, the consumer comparison platform, ULS Technology, a housing market comparison platform, D4t4, a big data services provider and software and IT services company SciSys. For investors who prefer to avoid analysing and picking stocks themselves, funds are the best option. Unfortunately, there are limited options of funds that offer direct exposure to the UK technology sector. One option is the Herald Investment Trust, which is focused on communications and multi-media tech stocks, with an emphasis on smaller caps. Its holdings have a 56% weighting towards UK stocks and it’s performed well over the past 5 years. It did suffer along with the wider tech sector over the last few months of last year but has recovered well over 2019. Investors have seen returns of around 200% over five years. The management charge is 1.08%. MSCI produces a MSCI UK INFORMATION TECHNOLOGY INDEX which tracks large and mid-cap UK tech stocks. Unfortunately, at present there is no ETF on the market to track the index, leaving it to investors to, should they wish, mirror the index themselves by buying individual stocks. This is, however, quite an endeavour and unlikely to appeal to all but the most enthusiastic investors. One further fund option, which doesn’t focus specifically on UK-listed tech stocks but encompasses the European market is the X-trackers Stoxx Europe 600 Tech Swap ETF (XS8R). However, at the time of writing it only has a UK allocation of a little under 5%. Unfortunately, that’s about it when it comes to funds that offer direct exposure to UK tech stock. Which in itself reflects the fact that the sector still has plenty of room to develop. Hopefully more of the new band of UK technology ‘unicorns’ still in private hands will go public over the next few years, beefing up Britain’s range of publically listed tech stocks.